The site is just beginning its work. minted in Estonia as well as related her. shopping coupons and comanies in Estonia, etc. I am 57 years old. We have already retired. Sam collect coins, paper money and cards of «plastic money»of the former republics of the former USSR. 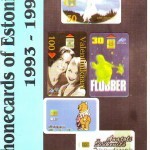 in «World Phonecard Catalogue» – Specialized Edition 2000.